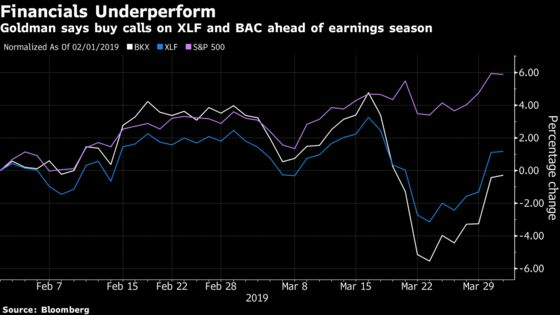 (Bloomberg) -- As big banks get set to kick off the U.S. corporate earnings season next week, Goldman Sachs Group Inc. is advising investors to use call options to position for a rally in financial stocks into May. Goldman derivatives strategists led by John Marshall underscored the “extreme underperformance” in the Financial Select Sector SPDR Fund, known by its ticker XLF, and the KBW Bank Index -- even after adjusting for the moves in equities, credit and rates. “We see the potential for a relief rally,” they wrote in a research note Tuesday. Specifically, they advise clients to buy XLF May $27 calls for 32 cents, versus a stock reference price of $26.34, and the BAC May $29 calls for 78 cents versus a stock reference price of $28.54. Financial stocks came under pressure last month after Federal Reserve officials said they don’t expect to raise interest rates this year. While XLF has recouped much of its post-Fed declines, it’s still down more than 9 percent from last year’s high in September. The strategists cite Goldman Sachs prime brokerage data coupled with the timing of underperformance that appears to show institutional investors, particularly hedge funds, are underweight financials. “This underpositioning creates a situation where upside asymmetry is undervalued,” they wrote. The first-quarter U.S. corporate earnings season begins in earnest next week, with big banks including JPMorgan Chase & Co. and Wells Fargo & Co. scheduled to report.